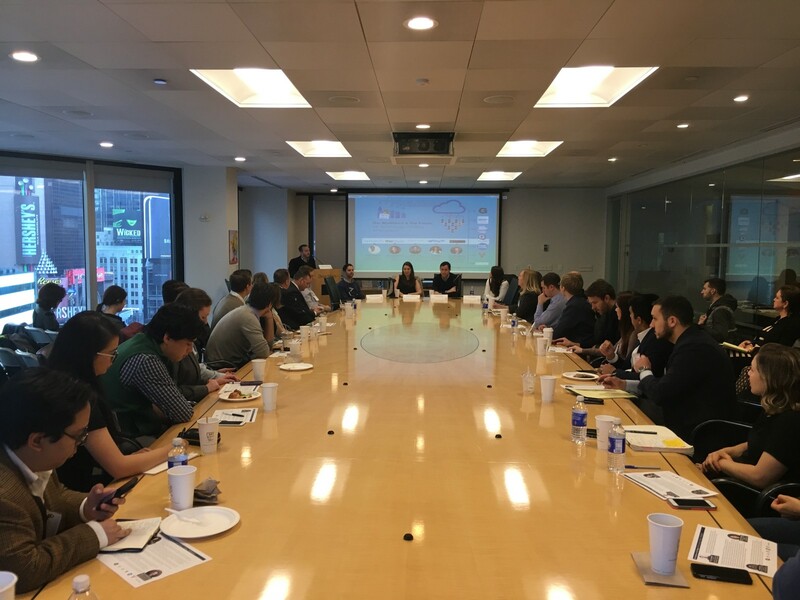 A discussion with the founders of today’s hottest talent acquisition-focused technology companies. 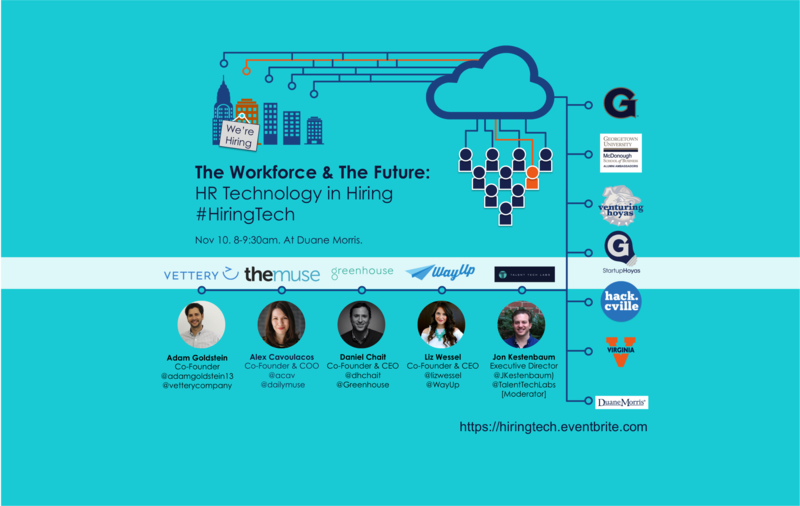 For this panel, we set out to discuss machine learning in HR, talent acquisition strategies, how marketing yourself will change in the next 10 yrs, workplace transparency, diversity in the workplace, candidate screening, company exploration, and more. We also had a “quick pitch” by Claire McTaggart (@McTaggartClaire), whose new company SquarePeg (@squarepeghires) will aim to match candidates and employers based on psychometric surveys. Below are some highlights from our discussion. If you are interested in attending similar future events — sign up here. What’s wrong in hiring today? “people are the most important asset”, and in the next breath you hear “we’re terrible at hiring”. I saw a fundamental breakdown in the way companies do hiring that causes them to feel helpless and disempowered, resulting in bad outcomes — employee turnover, bad hires, and other costly outcomes. The basic failing was really a lack of structure and process which results in a feeling of lack of control and lack of empowerment. They often grab an employee off their desk and say “Suprise, go interview someone” and throw them in a conference room, they don’t know who they are meeting, what to ask, why you are in that convo, and your lizard brain takes over and in the first 15 seconds tells you if you like a person and you spend the next hour kind of wasting everyone’s time. We try to put in place a better framework to give companies a way to design a better process. What graduating college students will need to do to market themselves better in the next 5-10 years. Liz — We help students and recent grads get hired. I was a recent grad not that long ago and I thought it was a miserable experience to get a job. I thought campus recruiting was terrible and career fairs not authentic. Students and recent grads signup, always free. They fill out a profile — we get 30–40 structured data points off of that. They can only see jobs they are qualified for based on that profile. People who decide those qualifications are in the business. Those would typically be put into an Applicant Tracking System (ATS) and rule out some candidates; for example if they have a major for an engineering job that isn’t computer science then remove them immediatly. I’m positive resumes won’t be a thing in 10 years. A lot of applicant tracking systems scan your resume and look for buzzwords. You resume gets placed higher or lower based on how many buzzwords. That’s pretty stupid becuase if you find someone who knows the words you can gain an advantage. That’s unfair and not right. I think there will be profiles that give a better understanding of who you are. I’m not talking about LinkedIn, that’s the first evolution of the resume. I think there’s got to be a more holistic way. First is an online presence — portfolio or personal website. They want to see personality. They are sick of hearing about every club you started. I was speaking at a conference over the weekend and someone stood up and asked “Everyone I know in college has started a business because they were told it’s necessary on your resume to get a job at Google. Is it?” And I think, what a terrible reason to start a business. I do believe showing entrepreneurialism or out of the box mindset is going to be absolutely necessary, but that’s not the only way. Alex — I think there’s a shift around transferable skills, whether it’s tracking systems — it’s not always that easy to show transference between industries or roles. One marketer is incredibly analytical which translates one way and another is very creative and that goes another way. There’s going to be interesting things around what did you accomplish and how did you do it. and not just what job is acceptable and looks good on my resume. Taking the time to understand that and target your applications. A lot of our hires wrote incredibly personal cover letters. Only half of companies read cover letters, we are one of the ones that do. Some did creative resumes, videos, projects. If you really have that passion you can stand out. Spray and pray is not the best method. Adam — Vettery is a talent marketplace. Candidates sign up — it’s a 90second form, upload a resume. We showcase candidates to clients. We are the opposite of a job board. We let companies go on the platform, see the candidates, and then request to talk to someone. You can look at resume, Linkedin, Github, Personal websites, all these different assets — but 97% of clicks on our platform were on candidates’ resumes. the resume is a nice linear format that makes processing for the hiring manager easier. I think a great cover letter, video, something else would be awesome in helping find differentiated people; the system has been trained that this is the fastest way. Being a recruiter/hr is relatively thankless; you fill a role and here’s another one. You are looking for efficiency. It’s a hard trend to break. LinkedIn is the 2nd most clicked thing on our site but it’s a miles wide gap still. Biggest complaint on our site is if a candidate doesn’t have a resume, we hear that they aren’t ‘showing effort’. Jon — One trend we’re seeing is a number of new platforms focused on niche markets — a series of services that add value to you to present yourself in a better way, example Chef’s on Apploy, Designers on Dribbl, and Developers on GitHub. Our #HiringTech panel at Duane Morris. What other jobs do you see forming in the next 10 years? Dan — as the saying goes predictions are hard, especially about the future. So take this with a grain of salt. Technology is a dominating force now. The question is where tech will leave room for people. In the future there are two kinds of jobs, people who tell computers what to do and people who computers tell them what to do. So he points out that in the olden days people did most of the stuff and computers did the hard parts. Computers came from helping people in the military get faster at calculating artilary trajectories. And now look at Uber, computers use people for the hard stuff. Computers run the whole network but the little last mile of putting the key in the ignition and not running over pedestrians, for now, is done by us becuase for now it’s harder for computers to do and we all know that’s going away too. So that’s the question in my mind is where do we fit in? Are we all going to sit around and get self-driven from our house to our friends house, have a VR headset on, have Netflix auto-take money out of our account? It’s hard to tell. People are always worried about this question. Since the industrial revolution, they wondered if the printing press and mechanical loom would give us more leisure. Writings from the 1800s said we’d be floating around in blimps and have more leisure time because work was going away. As tech takes over what we used to have to do, people are elevated and do new things. The good news is that ultimately I don’t know what those jobs will be, but history has progressed in a way that even though tech takes over work, there are always things that are uniquely human we can do. Alex — a tactical, shorter time horizon thought on this. A lot of new jobs are a combination of breadth and depth. Look at Marketing — now it’s Paid Marketing, SEO, etc as specializations. You understand the broader concept but you have a specification. Figuring out a thing I know that other people don’t, those things will become more specialized roles. What predictions do you have that AI will have on your products and within the space? Liz — we have cool things in the works. In the broader scheme, a lot of things that are asked of companies are the same thing. When a student submits via WayUp, we’ll enter them into an ATS and also serve up content to the applicant based on what you are applying for. Example for Aramark, we show the applicant how to do a video interview and it’s written by Aramark and based on their own FAQs. There can be some kind of AI that allows asking questions about a company. Chatbots on company HR websites that allow quick question and answer. Adam — There are scheduling interview applications now. That typically takes 7–8 emails back and forth and this app helps save time. Another one we think about is data for the matching side — lots of companies are matching platforms. Monster rolled this concept out 10–15 years ago, but a problem that the company has is that they don’t see the full funnel — who applies, who is accepted at each stage, who gets hired, and how long they stay. A job board where you just see the ad, you can’t see the funnel. At Vettery we see the funnel. It becomes more real when you see it and can create a path to change the funnel. Uber is a client of ours and request an interview with a candidate every week. After a while we see trends. With sourcing we can target more accurately. Alex — there are real concerns for me personally around bias and unconscious bias. Past performance isn't’ always indicative of future success especially as roles change. Even if you said this is the person I hired 2 years ago and I want someone like that, and you automate, you’ll end up with a homogenous at least skillset, if not demographically. So back to the AI question, it can only be as good as us knowing truly what we are looking for and being careful not to replicate mistakes we are making manually. What are you doing at The Muse to hire diverse talent? Alex — there are 2 pieces: 1) looking at pipeline and sourcing. If not diverse applicants, we need to look at different places. Posting on Hacker News you get people who look like Hacker News. In consulting at Analyst level there was 50% women and 50% men matching the undergrad population. At the Associate level 35% women matching what business schools look like. And 2) Look at top of pipeline and how it echos to bottom. If there is an issue at the bottom there are two problems: 1) you aren’t getting the right people in, or 2) you have a bias problem. That can be scary to look at. For us at the top of the funnel, we look at new places to post and getting the word out there. We look for skills and we also look at our core values. I avoid the word culture fit because of it’s connotations. We defined our 6 core values and use those in our hiring process. You won’t get all 6 values and 8 skills in an interview, but oneinterview for a product management role, for example, you will get looked at “are you a data driven marketer” and “are you a team player” and another will look at “critical reasoning/logic” and “can you work with technical folks”. If you don’t have vocabulary around “this person isn’t a fit” you may have bias. You need to work around the 6 core values and focus if they demonstrate or use language around that value. The other thing, when you are hiring people that aren’t the majority of the company it gives you a different perspective. For example if you are a woman interviewing and all 6 are men. It doesn’t mean only have women do interviews but remain cognizant of the perception. Jon — We’ve seen skills based assessments, psychometic based assessments, and combinations. Now we see simulation based assessments — what you would do on the job as a screening tool. Dan — I love questions where everyone says they want to do it and noone is doing it. One of our inspirations for the company is building a more inclusive workplace. We talk to a lot of very forward thinking companies on this. They make this central to their recruiting process and their brand. The way they talk about their org, their products, and their customers, the idea of being inclusive and having shared values is part of their thinking. Those companies push the boundaries of law to build a more inclusive workplace. Companies have a lot of fear around collecting and using data. The laws were set up to put guardrails around a worry of companies hiring candidates from only certain groups and now companies want to know, what’s the makeup of our funnel, who’s interviewing, who are we promoting? Collecting and using that info is scary for companies. They want us to build features to collect and use that data, and they’d use it for good, but their lawyers do not want them to do this. We are working on ways to do this. It’s a thorny problem. Inevitably an employee will leave and if they want to cause a problem can claim bias, fairly or unfairly. They’ll ask for all the data for all employees that you rejected and you can just say — we don’t have that data, so it’s easily defensible. We ultimately decided we are helping companies navigate this new world, but that we are driving change. We made the decision to collect and measure around who we interview, promote, our workforce, and making us better. I don’t know how it will end. I empahtize with companies that are grappling with this change and I urge them to think carefully about those risks and if they are worth taking. Don’t just listen to the lawyers, there are many risk — being overtaken by competitors, not representing your user base, missing great talent. Alex — it’s about it being top of mind. We had an executive recruiting firm bring us a slate that was all white male. I told them it was not acceptible. Notice it’s happening and then you can make change. Liz — from the candidate side, I was with a CPG company with a huge HR team including people who focus on diversity. We looked at the funnel of who we sent them for a job. They all went to top 100 schools, supply chain minors, qualified check. We told them at the top it was 34% Afircan American or Hispanic and 70% female. They were very excited about the 34% because historically it was 3%. They don’t track ethnicity through funnel except at hire, so it was going from 34% to 1%. She immediately called the person responsible for interviewing because that points to huge bias. You should note that the interviewers were all diverse, but there is still some process issue there. You program the rules. Depending on the criteria you put into the role, you are selecting a different pool. If you say only a woman who’s run a Fortune 1000 company, that’s a limited set. Similarly looking at CS degrees from top 100 schools versus others, you get different demographics. Look at skills — can this person code? Do they need a CS degree? No, they don’t. It’s pattern matching and a lazy practice. It’s one way to get there and efficient but there are more ways. How do you look at candidate social media in hiring? Adam — if it’s a role that involves it, then it’s impactful to the qualifications. The other extreme, I think social media can be used as a defensive perspective, make sure that a person with inappropriate postings doesn’t bring that into the workplace. Jon — there’s a tech called Fama that does social media checks. I’d suggest looking at it. Alex — it’s a judgement question. If you are representing the company the way you use social is reflective. You don’t need to be devoide of personality, but thinking about is this appropriate and that speaks to qualification for role. A lot of HR tech companies are connecting top talent with top employers and that’s where the money is. Are there going to be more middle tier, entry level job focused platforms? Liz — it’s not just on the startups, it’s on the HR team. We have a consultative approach to enterprise customers and ask why they only want the top 100 schools. 94% end up doubling the number of schools they recruit from once they start using us. To only recruit the top 100 you have to click 101 buttons, we try to make it hard. Adam — how we choose the groups we target. All the companies up here are hot brands. When we started Vettery, it’s hard. I need to attract cool companies and candidates. It’s hard to break the mold of what exists. Dan may have a way better product than the old ATS (Taleo, Success Factor, etc) that’s hard to sell against. Oracle has tens of thousands of sales people. That’s hard to sell against. Vettery too. We have to have placements and generate revenue and show going up and to the right. The path of the least resistance. That’s why we started in tech. Our model will work in any industry but it’s way easier to sell something when there’s not much supply. I’m up against LinkedIn with thousands of employees and limitless cash. A part of this is a funciton of business. As we scale we’ll open up to more middle of the road positions. We aren’t going to actively advertise that because we want to encourage candidates to come, so I can raise more capital, so I can keep going. If you start your own startup, you’ll see the best product doesn’t always win, you have to show real traction, and then you can accomplish what you want. Elon Musk wants to colonize Mars, but he didn’t start by trying to colonize Mars. He started by getting a rocket into space, and then cargo trips, and then satellites, and ultimately mars. If your goal is to work with the masses, you can’t necessarily start at the end. Alex —We publish 100s of articles per month — it’s the democratization of access to information. I believe a lot of business skills are not rocket science, but there are unwritten rules. We are publishing a new book on this, “The New Rules of Work”. If you want to see a shift in the marketplace, you talk about resumes for instance, some are bad because a lack of effort and others because they didnt have someone to show them how to do it. There are new ways to help in that area. Interested in attending similar future events?